Anisomorpha buprestoides, a walkingstick common in the southeastern United States, sprays chemicals that irritate and repel threatening insects, birds, or mammals. The active chemical in this substance was initially identified as a monoterpene dialdehyde. This compound can be present in several stereoisomeric forms, and subsequent studies have revealed that A. buprestoides produces at least three diastereomers: anisomorphal, dolichodial, and peruphasmal. However, no inquiry has been made to date into the geographical or developmental dependence of this variation. We report here that different populations of adult A. buprestoides spray either anisomorphal, or peruphasmal, or a mixture of the two stereoisomers. Additionally, offspring of a peruphasmal-producing population produced a variable mixture of anisomorphal and dolichodial but switched to peruphasmal upon reaching sexual maturity. This appears to be the first report of a developmentally regulated change in walkingstick insect chemical defense. 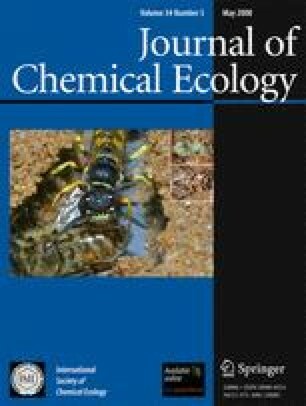 Our results suggest a more complex role of these substances in the overall chemical ecology of walkingstick insects. The online version of this article (doi: 10.1007/s10886-008-9457-8) contains supplementary material, which is available to authorized users. We thank Drs. W. Brey (NHMFL), R. Withers (Varian), R. Nast (Varian), and Bruker for the 1-mm HTS NMR probe. J. Rocca (AMRIS) provided help with NMR, and O. Conle (Bolsterlang, Germany) provided advice on walkingsticks. Dr. P. Teal (USDA) provided support and laboratory resources. Dr. Omjoy Ganesh (UF) provided technical help with making ternary diagrams. Drs. P. Sternberg (Caltech) and S. Benner (The Westheimer Institute of Science and Technology) provided helpful comments on the text. Funding was from the Human Frontiers Science Program and the NSF funded National High Magnetic Field Laboratory. The authors declare no competing financial interests. Supplementary Table 1 Dolichodial diastereomer composition of defensive spray field milkings from adult Anisomorpha buprestoides at various locations in the state of Florida, USA. Percent compositions are rounded to the nearest 1% unless determined to be <0.5% in which case they are indicated as such. Data were quantified using integrals of GC-FID traces, except for the GNV population which was measured by NMR. The gender of each individual is also provided (DOC 124 KB). Supplementary Table 2 Dolichodial diastereomer composition of defensive spray milkings from A. buprestoides at various life stages. Sixteen offspring (ten males, three females, and three undetermined) of the Gainesville Airport (GNV) population were chosen for this study. Percent compositions are rounded to the nearest 1% unless determined to be <0.5% in which case they are indicated as such. “0” means that particular isomer was not observed. “Dead” means that that animal died at that stage in the study. “N/A” means that the sample was unavailable for analysis, possibly lost. Data were quantified using integrals of GC-MS traces. Gender of each individual is also provided. Gender was not determined for the three animals that died early (DOC 172 KB). Supplementary Figure 1 Representative GC-MS chromatograms of individual Anisomorpha buprestoides on different days during the developmental portion of this study. Shown here are data from six individuals (five males and one female). The insects were raised from hatchling to adult in individual containers. Individual secretions were collected from hatchlings and at subsequent intervals ranging from 1 to 5 weeks, and secretions were analyzed by GC-MS. The elution times of the three A. buprestoides isomers, peruphasmal (P), dolichodial (D), and anisomorphal (A) are indicated in red. Missing or baseline data indicate difficulties obtaining that particular spray (DOC 173 KB). Supplementary Video 1 Video showing the feeding of 13C6 glucose to a wild male A. buprestoides from the GNV population. A 1-ml syringe was used to place droplets of 400 mM 13C6 glucose in water on the mouthparts of the insect until the insect stopped drinking it (usually after drinking about 50 μl). This was done every other day for about a month, feeding the insect variegated privet on days where 13C6 glucose was not given to provide the insect with additional essential nutrients (DOC 173 KB).